Known for roadside stalls selling fresh citrus and stone fruit. Berri is one of the commercial hubs of the Riverland, with extensive shopping outlets and a beautiful green riverfront complete with dining riverside options. The town of Berri takes its name from the Aboriginal word 'bery bery' meaning 'bend in the river' and was proclaimed in 1911. Well-known fresh produce stalls are located on the outskirts of town, or you can purchase local goods from the Berri Visitor Information Centre. Alternatively, pick up your fresh produce requirements from the Riverland Farmers’ Market, held each Saturday morning. There is a range of dining in and around Berri, try the uniquely themed Mallee Fowl Restaurant for a quality meal in quirky surroundings. The family-owned River Jacks Cafe overlooks the Murray River and specialises in European Cuisine, utilising local and fresh ingredients from the region. Berri Hotel stands magnificent on the waterfront, offers both cafe and restaurant options and is the starting point for a relaxing stroll. Inspect the mural under Berri’s bridge that depicts the Aboriginal heritage of the area and visit the installation that stands in tribute to Australia’s famous Aboriginal tracker, Jimmy James. Walk the four-kilometre riverfront walk from Berri to the popular recreational and camping reserve at Martin Bend – a great spot to sit back and relax. Or climb the Water Tower Lookout for a different view of the river and town. Discover the creeks and backwaters with Canoe Adventures offering hire as well as guided tours and expeditions. This is a truly unforgettable experience to view the natural beauty and diversity of the Murray River. Or take in Berri from a different angle, meandering among the creeks and backwaters on an air boat ride. 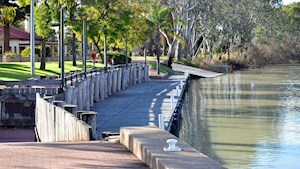 Discover beautiful Riverland towns. Hire a houseboat, book Riverland accommodation and find out the history and attractions each town has to offer. Discover Riverland food and wine, craft brews, cellar doors and distilleries & award winning restaurants. Discover Riverland Events - There’s always something happening with food and wine, family fun. Stay in a Riverland Accommodation! Riverland Accommodation - Houseboats, 5-star luxury, river shacks, B & B's, historic homesteads, secluded camping spots, caravan parks, hotels and motels. The Riverland is a favourite holiday destination, with activities for all ages and a diverse region to explore. Navigating your way to the Riverland is easy, the hard part is deciding what to do first. Once you are in the Riverland, stay, play, explore and relax. Fill out the form below and select send message. © 2019 Destination Riverland Inc.